Follow steps for gel electrophoresis. Orient top notch of gel electrophoresis apparatus. Place gel tray into larger tray. Create 1% gel by putting .6 grams of agarose into flask. Using hot gloves, grab flask out of microwave and swirl flask vigorously. Place back in microwave for 30 more seconds. When flask is taken out of microwave, make sure that the agarose is completed dissolved. Set up wells on gel electrophoresis apparatus. The mold for the first digest is B-10. Use the thin "teeth" and slip in the notches. Waited 10-15 minutes for gel to cool. Add EtBr (ethidium bromide) to the agarose gel. There should be 1 microliter of EtBr per 10ml of agarose gel. Therefore, 6 µL. The gel was poured into tray. Wait twenty minutes for gel to settle. Wash the agarose gel flask. Pipette 15 μL of DNA ladder into first well. Pipette 5μL of PCR reactions into subsequent wells. Turn on electrophoresis (105 V) and let run for thirty minutes. Pipette up and down mixture several times to make sure it's thoroughly mixed. Centrifuged at top speed for 30 seconds. Flow through was discarded. Added 200 μL of Wash Buffer the column and centrifuged for 30 seconds. Repeated step. Spin Column for each PCR rxn placed in new 1.5 mL tube. 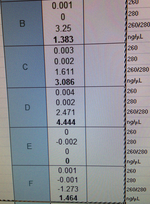 30μL of water was direct added to the column to elute DNA. ---Karmella 13:55, 10 December 2012 (EST): Do not gel purify PCR products. Instead, Zymo DNA Clean & Concentrator kit to clean up the PCR reactions. Elute with 30 μL H2O. Measure concentration on the plate reader.